Fourteen current John Deere Power Products employees have been working at the facility since its doors opened in 1988. 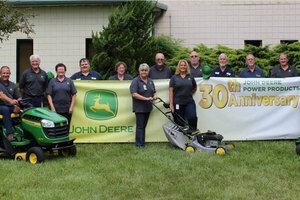 The John Deere Power Products facility in Greenville, Tennessee is celebrating its 30th anniversary this summer with a social gathering on August 3. The event will feature live music, catered food, fun and games. Long-time employees will also be honored at the gathering, which will be held at the facility. The Greenville facility is where the 100 Series lawn tractor and residential ZTrak™ zero-turn mowers are specially manufactured. Throughout its existence, the facility has been honored with several accolades, and a total of 14 employees have been at Power Products since it initially opened in 1988. Power Products employees are all active in the local Greenville community. Employees often volunteer at daycare centers, participate in the Backpack Program for city schools, and take part in landscaping and lawn care projects.